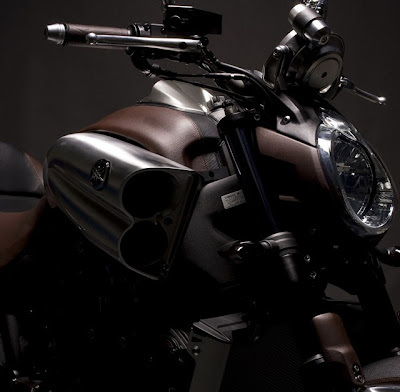 After the first CR&S motorcycle, the VUN, now the company CR&S (short for Café Racers and Superbikes) is showcasing their second customized bike at the at the 68th International Bicycle and Motorcycle Show to be held November 2 to 7 at the Milan Fair. Named as DUU, you may remember the prototype was first exhibited during the 2009 EICMA. ‘DUU’ in Italain stands for ‘duo’ indicating the two liter (1916 cc) dual engine plus being a two seater. 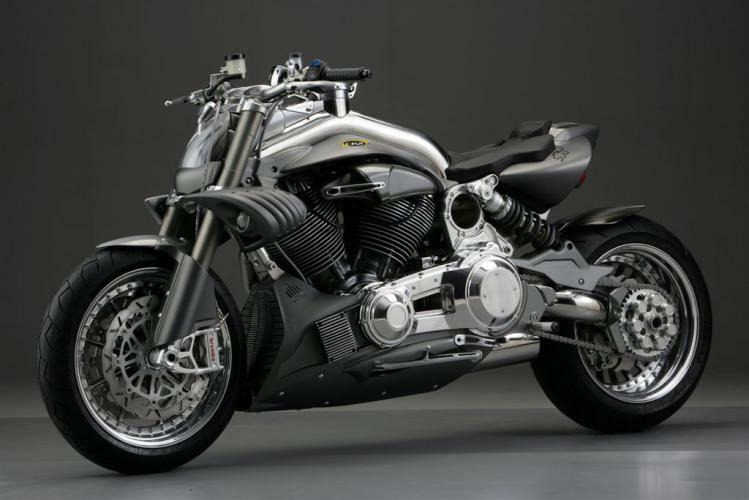 The DUU is a naked premium motorcycle with a typical sporty European styling combined very effectively with a big twin, typical of American muscle bikes. The engine retains the S&S “X-Wedge" engine, its character and high performance. 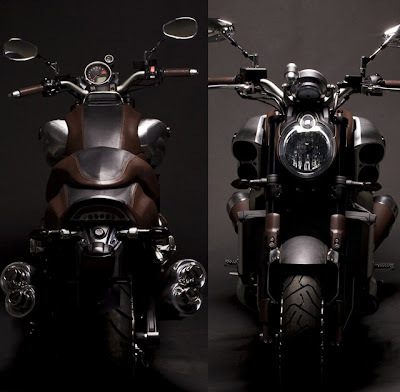 Customers of the DUU can choose his motorcycle through a wide range of technical and aesthetic options offering countless configuration options including styling options like a single or two-seater. The CR&S DUU, just like the elder sibling VUN, is made with high quality, durable materials using the best components and the motorcycle according to CR&S is aimed at “mature” motorcyclists who demand a little more from their custom bikes. Each motorcycle is hand made by the CR&S team which means they work on only one CR&S DUU at one time. The first batch is expected to roll out early 2011 with a production volume of a few dozen units per year. Price will start from € 22,000 ($30, 500). Unlucikly, the entire 2011 projected lot has been already reserved, in a way, it is sold out even before its release. It is the high quality and less quantity which makes the CR&S brand so sought after. The DUU has already been chosen in the MAD-Moto Art Design as one of the best designs in the last 50 years. The CR&S website had all the info and loads of photos on the DUU and you may visit the ‘Download’ area for higher resolution images. That the YAMAHA V-Max is one of the best looking power bikes is beyond anyone’s argument. But then some people just can’t enough of its beauty and now want something more. 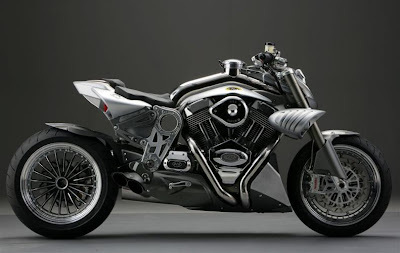 What you see here is the YAMAHA V-Max Hermes. It has been created so that the V-Max won’t go unnoticed. Yeah, right!, as if it was really hard spotting a V-Max. So wht is the Hernes, as you can see it is almost fully covered in leather giving the V-Max a unique and exotic look and feel. Hermes, as you are aware is an internationally recognized fashion house. So when it decided to don clothes for the V-Max as a custom made motorcycle, you know it will stand out. Yamaha will be releasing three colour patterns to these limited edition series and each pattern will have a two-tone colour. Available colours are the V-Max "Red Demon", dark red and brown satin sheen magnesium, the V-Max Orange Metallic "orange satin highlighted with a brown band and magnesium V-Max Soft Brown "white and brown magnesium. You have to pre-order to book the custom bikes and more painstakingly, you have to go to France for the same as these are released by the Yamaha France company only for the French market. Literally, this is a combination of ultimate fashion and power. No doubt, one of the best products coming out from the Japanese giant deservedly needed a more luxurious image for a select few and along with the buffalo leather, the custom bike also gets additional custom made items like brushed aluminum mirrors, meter case and exhaust.These V-Max Limited Edition are priced at € 23, 490 ($32, 850) including VAT. 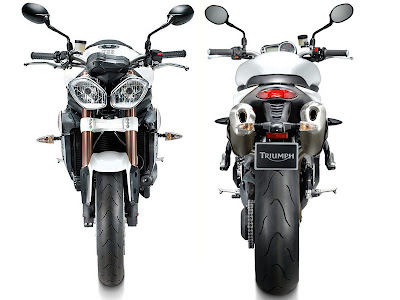 One of the most celebrated and iconic bikes from the current generation is getting a makeover in a big way. Yes, this is the 2011 Triumph Speed Triple, a bike which finds many favours in Hollywood and also among the Hollywood Superstars. It retains the typical edgy, bare bones brytal styling but as you can see, the headlights get a complete new makeover with (kind of less bug eye and more) cat eyes which is the major difference. Performance figures are better. 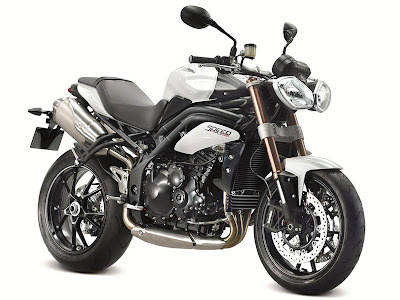 Actually the Speed triple has been hitting the gym and so not only has it only lost 3 kg/ 5 pound but it has also gained 7bhp and 6lb/ft or additional power and torque. The outgoing model had power and torque figures of 128bhp @ 9,250rpm and 76lb/ft @ 7,550rpm while the 2011 model as such delivers 135bhp of power @ 9,400rpm and 82lb/ft of torque @ 7,750rpm. Weight has reduced from 217kg/477lbs to 214kg/472 (wet). The weight loss program needs to thank the all-new aluminum chassis. The riding position has also shifted a little forward and Triumph believes it will improve handling. 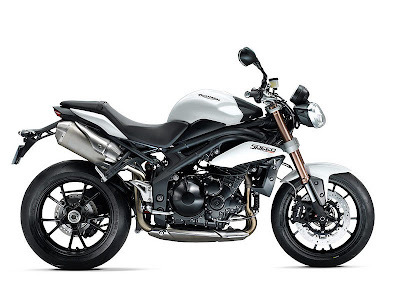 Yes, the Speed Triple will also have ABS as optional and has new 43mm USD forks that are fully adjustable (Showa Monoshock with adjustable preload, rebound and compression damping, 130mm rear wheel travel retaining the single sided swingarm). Other new things also include a new pair of dials and clocks. 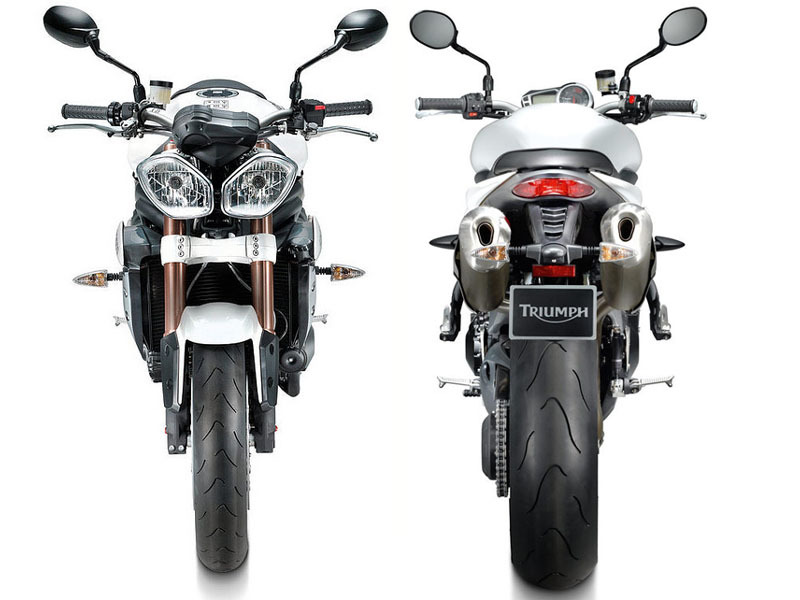 You can choose from three colour variants, Phantom Black, Crystal White and Diablo Red. 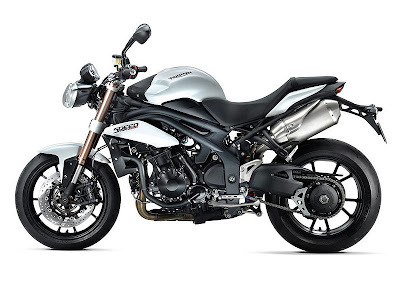 Visit the TRIUMPH 2011 Speed Triple website for more information.